Tim Merel is managing director of Digi-Capital. There is nearly as much confusion as there is excitement about augmented and virtual reality. While VR could be big and AR could be bigger (and take longer), there are more questions than answers out there. I’ll be doing a deep dive on one aspect of AR/VR every month. This month we’re kicking off with business models. AR/VR hardware sales, e-commerce sales, ad spend and mobile data/voice could drive more than 80 percent of all AR/VR revenues. Things might look a little different than what you expect. Business models are hard to figure out during platform shifts, but can play out to great success (as in the case of mobile over the last decade). AR/VR is the fourth major platform shift (after PC, web and mobile). CEOs need to decide how to play. At the end of the day, business models come down to installed bases, use cases and unit economics, so let’s dip our hands in the virtual money pot and see what comes out. Facebook paid $2 billion for Oculus. Magic Leap took $1.4 billion from Google (and others). Apple bought Metaio. Plus major commitments from Microsoft, HTC/Valve, Sony, Samsung and other heavyweights. Serious folks. Not their first rodeo. But hardware is hard to win. So why this much interest in an unproven early-stage hardware market? Looking at the future through the lens of the past helps, and that’s what is happening here. Apple owns global mobile hardware profits in the market it created, making it the most valuable company on the planet (mostly). Google has taken MVP as well, but increasingly relies on advertising sold using other people’s mobile devices — even though it owns Android. Facebook learned valuable lessons from how mobile played out, including its early fumble and spectacular recovery. Hardware is the strategic high ground during platform shifts, and these guys know it. AR/VR could have an installed base in the low single-digit hundreds of millions by 2020, ranging from low-end VR Cardboard up to premium AR Magic Leap (and everything in between). With long-run unit prices from free up to something equal to top-end smartphone prices, hardware sales could drive more than $4 of every $10 spent on AR/VR by 2020. Ignoring hardware is not an option for established leaders and new insurgents. Hardware sales could be the one business model to rule them all in AR/VR, and early investment looks like smart money. Alibaba led Magic Leap’s $793.5 million round at a $4.5 billion valuation, with vice chairman Joe Tsai joining the board. Alibaba and Tsai are amongst the best and brightest in China (and the world). Why would a Chinese e-commerce company throw hundreds of millions of dollars at a Florida hardware startup with no sales? E-commerce sales (goods and services, not in-app purchases) could take almost $2 of every $10 spent using AR/VR in five years’ time. Alibaba, Amazon, eBay and a range of new startups will be able to sell stuff to folks in totally new ways. Some of this might cannibalize existing e-commerce/m-commerce, but AR/VR could also grow e-commerce’s share of all sales. For app and content developers (not selling hardware, goods or services), advertising sales could be the most valuable business model at around $1 of every $10 generated by AR/VR. The first AR advertising unicorn emerged this year with Blippar, and that’s before the head-mounted display market hits its stride. AR/VR entrepreneurs don’t need to reinvent the virtual wheel. They get to augment it. As advertising formats emerge, from virtual banner equivalents to full-blown, native AR/VR formats like The Martian VR Experience, AR/VR advertising could follow the path blazed by web and mobile. With one-third of global advertising and half of all Chinese advertising in web/mobile in 2016, platform change means serious business for advertisers. AR/VR advertising is more immersive than any rich media (when done right), and ad spend should follow the eyeballs. Mobility will drive installed base for AR/VR. For AR, mobility is even more fundamental than for VR. AR devices that can’t make phone calls or access cloud-based services all day out of Wi-Fi range won’t be able to replace smartphones in the long run. AR devices that don’t help mobile networks make money from data/voice won’t be cross-subsidized by the telcos — a key to mass adoption. We’ve pushed hard for AR hardware makers to prioritize cellular capability and longer battery life on roadmaps for this reason. Mobile network data revenue from AR/VR could be golden for the telcos. YouTube estimates that each frame of 360 video requires 4-5 times the bandwidth of traditional video. High-resolution, high-frame rate, stereo images and data could drive some applications even higher in terms of bandwidth requirements; someone has to pay for all that data. AR/VR data could be the catalyst to break mobile networks out of their current annual revenue growth of less than 2 percent — so it’s a big deal. Mobile network voice revenue for AR/VR (voice with mobile Quality of Service, not VoIP) will largely cannibalize existing mobile voice revenues rather than add new revenues for the telcos. They’ll be there, but this isn’t new money. For mobile developers, in-app purchases are one of the core business models. Top-grossing mobile charts are dominated by free apps, and even premium console/PC games markets see downloadable content as a major business model. The AR/VR free versus paid app question is yet to be answered, but users have been trained that digital content is mostly free. Younger users, in particular, rarely pay for content, so there’s no putting the free genie back in the bottle. Ad spend should follow the eyeballs. In-app purchases should be a major business model for AR/VR developers, whether through speed-ups/virtual items or additional services. There will be a premium apps market (see below), but in-app purchases could play as big a role in AR/VR as they already do in the mobile and web markets. Netflix, Amazon, Hulu, Spotify and others proved how effective subscription business models can be for web/mobile. AR/VR content and SaaS players are set to offer services that folks will happily subscribe to every month (although these might come at the expense of other platforms). Higher levels of service and ad-free services could drive AR/VR subscription revenues, although more innovative models may arise. 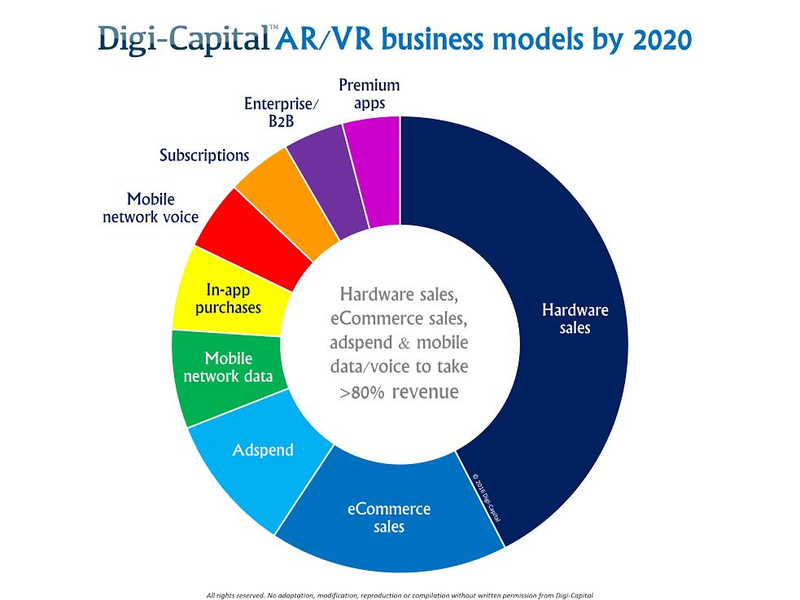 The enterprise market is well-served by AR players like Microsoft, Meta, ODG and DAQRI, as well as a range of VR service/solution providers. With use cases across military, medical, education, architecture/construction, maintenance and beyond, enterprise sales will be a driver for both AR and, to a lesser extent, VR. Replacing traditional desktop/laptop machines might take some time, but business users will be able to improve productivity in specific areas. With HoloLens now on the International Space Station, AR/VR will reach new heights for enterprise users (pun intended). B2B sales from AR/VR services/solutions providers will also be part of the mix. B2B revenues will come from areas like graphics engines (Epic’s Unreal Engine at the high end to bundled, free services like Amazon Lumberyard with AWS), facial animation (Cubic Motion), gesture recognition (Leap Motion, Gestigon), 3D model distribution (Sketchfab) and more. Premium apps will have a role to play in AR/VR, despite the potential dominance of free apps. The higher-end the user experience, the greater the potential for paid business models. High-end VR games could see the highest proportion of premium apps, leveraging an installed base of console/PC gamers accustomed to paying up to $60 for their fun. Non-games AR/VR consumer apps more broadly could see a lower proportion of premium apps, similar to the paid share of mobile apps today. Back when Angry Birds’ 99-cent app ruled mobile, few predicted Supercell’s and King’s in-app purchase business models would dominate today. So while long-term business models could look different than those we’ve explored, AR/VR entrepreneurs don’t need to reinvent the virtual wheel. They get to augment it. In the coming months we’ll be digging in all over the place, so feel free to reach out if your company is doing something special (no guarantees on covering you, it’s a big market). Topics will include AR/VR video, commerce, social, voice/messaging, data, enterprise/B2B, advertising, space (I’ve been talking to NASA), games, theme parks, user interfaces, optics, processing (CPU/GPU/VPU), audio, platforms, tracking/sensors, venture capital, countries (U.S., China, others), pricing and users.